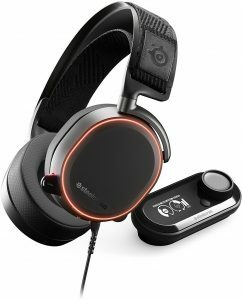 Another on the list for best 2018 gaming headset from SteelSeries – the SteelSeries Arctis Pro + GameDAC Gaming Headset. 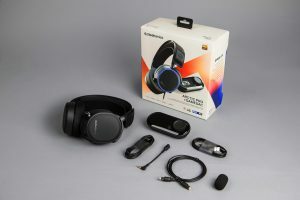 Arctis Pro + GameDAC is the world’s first certified Hi-Res gaming audio system. With specs surpassing the Japanese Audio Society’s rigorous Hi-Res requirements, you’ll hear game audio and music like never before. Premium speaker drivers with high-density neodymium magnets reproduce Hi-Res audio to 40,000 Hz, nearly double most headsets (22,000 Hz) and twice what the human ear can hear. Next generation Headphone:X v2.0 immerses you in the action by delivering incredibly accurate positional cues. Lose yourself in the game as the audio comes to life all around you. The heart of the GameDAC is the legendary ESS Sabre 9018, revered for its unsurpassed audio quality with 121 dB of dynamic range and -115 dB THD+N. Bass sounds tighter, effects more distinct and positional cues more accurate. Join external VoIP chat or take phone calls from another device via the 3.5mm mobile jack. Use the Line Out jack to connect to a pair of powered speakers or to output your audio mix for streaming. The intuitive OLED menu lets you quickly adjust your volume, balance your ChatMix, and dial in your perfect sound with the onboard 10-band equalizer, all without installing software. Arctis Pro + GameDAC was built from the ground up to deliver the best audio ever found in gaming. Esports athletes demand the highest quality sound, comfort and materials and Arctis Pro delivers. If you are familiar with Google Chromebook and fell in love with it, then probably you want to try it’s “stick-size” version. The ASUS CHROMEBIT is another choice you want to consider if you’re into having a compact desktop. While most of the mini desktop in the market is powered by full Windows 10 operating system, Asus Chromebit however, is powered by the latest Chrome OS. ASUS Chromebit CS10 measures just under 5 inches and is the world’s smallest Chrome OS device. Turning your large monitor or TV into a computer running the latest Chrome OS is easy – simply plug Chromebit CS10 into the HDMI port and pair it with a Bluetooth keyboard and mouse. Chromebit CS10 gives you all the computing essentials so you can conduct online research, catch up with friends, or watch Full HD movies on the big screen. You can even use it for business applications or digital signage and self-serve kiosks. To accommodate the angles and positions of HDMI connectors on different displays, it comes with an HDMI extension cable. Adhesive stick-on hoop-and-loop fasteners help hide Chromebit CS10 behind your monitor or TV or put it out front for easy access. Delivers Full HD graphics performance. Together with 2GB of memory, 16GB of eMMC storage, dual-band 802.11ac Wi-Fi, Bluetooth 4.0, and both USB and HDMI ports. Every Chromebit CS10 comes with 100GB of free Google Drive space. You’ll always have access to the files you need as well as your favorite Google services. Chromebit CS10 is the perfect TV companion. Just slot it into your TV or monitor’s HDMI port and pair it with a Bluetooth keyboard and mouse to create a fully-functional Chrome OS computer. With Chromebit CS10, you can browse the web, access thousands of features and apps on the Chrome Web Store, watch YouTube videos or live football games, and more! Chromebit smart TV experience brings more creativity and productivity to your living room. Before buying this product please consider that while it is pocket size, unless you don’t have Smart TV, wireless keyboard and mouse, you cannot use it. And that the only USB port available is 2.0 instead of 3.0, and that it lacks a micro SD expansion slot. REVIEW of Azulle Access Plus Windows 10 Pro Fanless Mini PC Stick, T3 Z8300, 4GB RAM+32GB! A more smaller version of mini desktop computer is the Stick PC. First hit the market in 2003 equip with Linux Operating System and since then have leveled-up up to the present. One of which is the Azulle Access Plus Mini PC Stick dubbed as Amazon’s Choice. Azulle’s access plus continues the legacy of being the worlds only computer Stick with an Ethernet port. Preloaded with a full version of Windows 10, 64-bit operating system. Powered with a 64-bit Intel Quad Core Processor, the access plus provides a smooth and seamless experience toggling between various programs. Equipped with 4GB of DDR3L RAM, 32 GB of onboard storage. Micro SDXC card Slot providing up to 128GB of storage makes it ideal for watching content and surfing the web. Includes Dual band Wi-Fi, provides stable connections with higher speeds for browsing and streaming. Bluetooth 2.4 provides great connection to wireless peripherals. With its compact design, the Access Plus is small enough to fit in your pocket, making it the perfect computer for travel. This palm-sized device lets you stream and browse from anywhere by connecting to any HDMI compatible TV, kiosk, projector or screen display. Some of the customers who bought this product is that the downside would be while this is a small device, it gets very hot considering it’s size. The full Windows 10 operating system eats up the 19GB storage space, thus, leaves little space for other usage.